Several Democrats railed against dark money groups during the 2018 midterm elections, but a new report shows that liberal groups outspent conservative ones, spending more than half of the $150 million that went towards bankrolling House, Senate, and statewide campaigns. Issue One, a nonpartisan advocacy group, released a report showing liberal groups spent 54 percent of the 2018 dark-money total compared the conservative groups that spent 31 percent of the total. Nonpartisan groups accounted for 15 percent of the total spending by dark money groups, the Huffington Post reported. "As we head into the 2020 presidential election, both parties must reject the opaque ways some of their wealthiest donors are influencing elections," said Issue One CEO Nick Penniman. "Dark money is the most toxic force in politics." Unlike many political action committees that disclose their donors, dark money groups, which are mostly nonprofits and trade organizations, do not have to disclose their donors. Monday marked the 9th anniversary of the Supreme Court's landmark decision in Citizens United v. Federal Election Commission, which loosened campaign finance restrictions on unions and corporations. Several Democrats were critical of the decision and used campaign finance reform as a pillar of their campaign, but they benefitted from the decision and dark money. Andrew Gillum, the unsuccessful Florida Democratic gubernatorial nominee, was an outspoken critic of corporate and dark money in politics, but his political action committee, Forward Florida, accepted $1 million from the Democratic Governors Association, which raised millions of dollars in dark and corporate money over the years. His PAC also accepted at least $266,000 from nonprofit Collective Future, which is not required to disclose donors. Then-Rep. Kyrsten Sinema (D., Ariz.), who would go on to win her senate race, railed against dark money during her 2018 campaign and was endorsed by the End Citizens United PAC, but she benefitted from dark money flooding Arizona. Majority Forward spent over $500,000 on behalf of her and spent nearly $7 million against her Republican opponent, Martha McSally, who was later appointed to the Senate by Gov. Doug Ducey (R.). A mysterious super PAC, Red and Gold, also got involved in the Republican primary and spent $1.7 million against McSally. It was later revealed that Senate Majority PAC, a super PAC aligned with Senate Democrats, and a couple billionaire donors donated to Red and Gold. 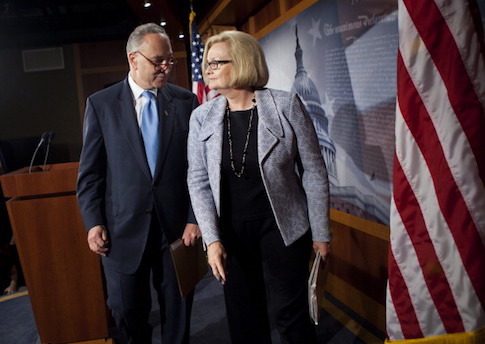 Other Democrats who were hypocritical on dark money include the unsuccessful campaigns of senate candidate Phil Bredesen (Tenn.), former Sen. Claire McCaskill (Mo. ), gubernatorial candidate Stacey Abrams (Ga.), former Sen. Bill Nelson (Fla.), among others. This entry was posted in Politics and tagged Andrew Gillum, Bill Nelson, Claire McCaskill, George Soros, Kyrsten Sinema, Phil Bredesen, Stacey Abrams, Super PACs, Tom Steyer. Bookmark the permalink.